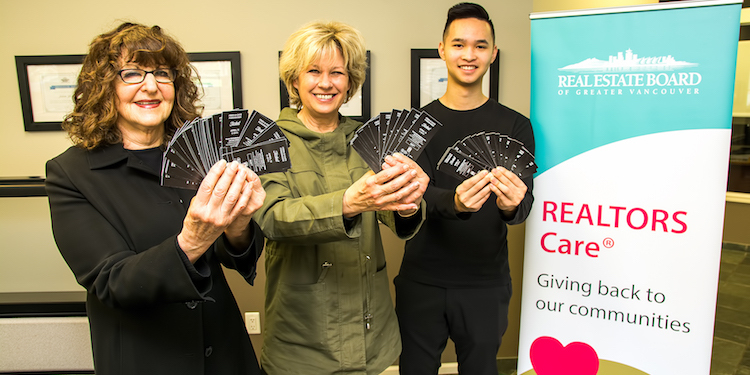 Richmond realtors are selling tickets to a Feed-U-Cate fundraiser April 11 at The Buck and Ear. It was a Thursday in September, just before the long weekend. While waiting to pick up her granddaughter from elementary school and take her to skating lessons, Janet Downey observed another class being dismissed. As the kids were leaving, the teacher had a number of instructions and offered everyone an apple. One girl asked if she could take two, one to give her sister. At this point, the teacher asked the girl to wait and after the rest of her classmates were gone gave the girl all the remaining apples. The expression on her face is etched in Downey’s mind. Afterwards, Downey asked the teacher what prompted giving out the apples. She explained the school offered a Breakfast Club because there are so many children coming to school hungry. And when they do so, it has an impact on their learning. In addition to the Breakfast Club, the school tries to provide students with some other food (bread or fruit) that the kids can take home on the weekend. “I was also shocked to learn that we (Richmond) have a large child poverty rate and as a result many children in our neighbourhoods and community do not have the basics,” she says. Poverty in Richmond can be well-hidden. Behind a small window over a garage is the tiny suite that’s home to a mom and her children, living on welfare. Downey decided she had to do something to help. She has started a campaign to raise awareness among her real estate colleagues and on Thursday, April 11 at 6 p.m. she will host a fundraiser for the Feed-U-Cate 38 Trust Fund at a Steveston pub, The Buck and Ear, 12111 Third Ave. Everyone is invited, where for $25 patrons will receive a burger and beverage. But tickets much be purchased in advance through Downey at 604-220-9982. Downey has done a lot of research into the topic, while also connecting with a number of administrators, teachers and volunteers assisting with breakfast clubs in many Richmond schools. Retired district administrator Glenn Kishi started Feed-U-Cate and continues to volunteer his time for fundraising.